Canada’s Einstein Exchange is a global cryptocurrency trading platform. 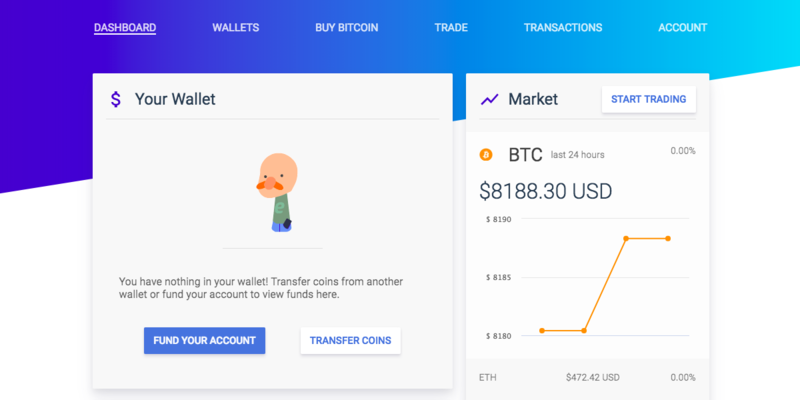 It supports fiat deposits and lists more than a dozen popular cryptocurrencies that trade against the US dollar. Unlike many other exchanges, the company also operates a 24×7 call center. The thing is, this startup company is less than a year old and still in its “beta” phase. Early missteps and distracted leadership amplified the stresses of last year’s crypto boom, tarnishing the company’s reputation. However, staff increases and executive hires are tightening execution. Keep reading our Einstein Exchange review to find out whether this newcomer to the cryptocurrency trading world should be on your radar. Accepts US and Canadian dollar deposits. Most crypto only trades with US dollars. No volume discounts on trading fees. What Can You Trade on Einstein Exchange? Einstein Exchange invited people around the world to join the open beta phase of the exchange’s development in 2017. This timing may have seemed good as this was at the height of the bitcoin rally. Unfortunately, the young startup did not have the systems in place to handle the influx of new customers. Gokturk explained to the CBC a few days later that Einstein Exchange only employed 22 people in its Vancouver office and only some of them worked on verifying new customers. “It was just madness,” Gokturk said of his company’s rapid growth. “Word of mouth spread like wildfire.” To work through the backlog, Einstein Exchange suspended new account activation and hired 30 employees at a dedicated call center in Montreal. The reason for Einstein Exchange’s rocky start may have resulted from more than just last year’s crypto mania. Gokturk himself had other drama going on in his business life. Gokturk left an investment banking career in 2005 to start his first fintech business. He built Versapay into a national provider of electronic payment systems for Canadian and American businesses. In 2011, only a year after taking Versapay public, Gokturk was ousted by his own board of directors. Within months, Gokturk founded another payments processor. Payfirma provides credit card processing services to small and mid-sized businesses and was the first Canadian company to provide credit card payments on mobile devices. “We’ve got thousands of customers using our mobile solution – anywhere from small businesses all the way to large enterprises like United Van Lines,” Gokturk said in a later BIV interview. But even as Gokturk was laying the foundations for Einstein Exchange, things started going wrong at Payfirma. The company’s independent directors rejected Gokturk’s plans for a reverse takeover. The boardroom battle went public as press releases from one side and the other side tried to sway shareholders’ votes. All of this happened in late 2017 and early 2018 at the same time that Einstein Exchange was struggling to keep pace with its own growth. Gokturk fully-focused on his crypto business only after selling and leaving Payfirma. Several of Gokturk’s employees at Payfirma followed him to Einstein Exchange. A co-founder, Leighton Hay, was a Payfirma business development manager. Rodrigo Barraza, Einstein Exchange’s chief technology officer, was Payfirma’s front-end developer. In order to get Einstein Exchange’s systems under control, Gokturk looked for investment industry expertise and hired Jean Paul Matias as its vice president of operations. Matias ran the institutional custody and brokerage division at Qtrade Financial Group for six years before striking out on his own as an independent consultant. The Financial Transactions and Reports Analysis Centre of Canada (FINTRAC) does not require cryptocurrency companies to register as Money Services Businesses (MSB). Some do it anyway to demonstrate they comply with anti-money-laundering (AML) and know-your-customer (KYC) regulations. Einstein Exchange has not registered as an MSB, but still provides AML/KYC reports to FINTRAC. Einstein Exchange does not disclose its listing policies. 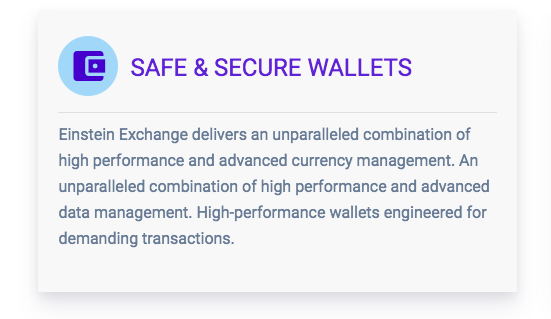 The company says little about its security procedures other than it “delivers an unparalleled combination of high performance and advanced currency management.” Apparently, it is so unparalleled that the website has to say it twice. Unusually for companies in the crypto business, Einstein Exchange gives customers direct support through online chat and a Montreal-based call center. Customers can also use the ticket-based system to request help. To let customers find answers to more general questions, Einstein Exchange provides a well-documented knowledge base and manages its own subreddit at r/einsteinexchange. As discussed earlier, Einstein Exchange got off to a rocky start. The company on-boarded as many customers as it could even though it was still in “beta”. Many customers struggled with delays in deposits, exchanges and withdrawals. Of course, none of these issues were unique to Einstein Exchange. Every trading platform suffered the same issues last year. The first data field you’re asked to complete when you register, your nationality, only has two options: Canadian and International. Provided you don’t live in a sanctioned country, Einstein Exchange will let you trade regardless of nationality. Einstein Exchange has a two-level verification structure for individual accounts. As you provide more information about your identity, you get access to more of the exchange’s features. Unverified: You can deposit crypto and trade digital currency. You cannot withdraw fiat or crypto. Verified: You can deposit, trade and withdraw without restrictions. You have a choice of two paths to verification. If you live near an Einstein Exchange office, you can take care of everything in person. The other option is to use the company’s online verification. In both cases, you must provide two forms of identification. One must be a government-issued ID, while the other can be another government ID or a bank statement. You must also provide proof of residence with a utility bill or similar document. The most recent annual corporate filing. The most recent annual report. Einstein Exchange gives you access to bitcoin, bitcoin cash, dash, ether, flash coin, golem, litecoin, omisego, ripple, zcash and 0x. You will also see markets for Ethereum tokens, such as EOS, that have since migrated to their own blockchain. Although Einstein Exchange accepts US and Canadian dollar deposits, it operates on a US-dollar basis. The company transfers all fiat withdrawals as US dollars. Einstein Exchange’s trading platform uses fiat-based markets. The US dollar base market has trading pairs for all of the supported cryptocurrencies. The Canadian dollar base market only has two trading pairs CAD/BTC and CAD/ETH. Since you can’t place crypto-to-crypto trades, you have to place to trades to make the conversion. In order to convert bitcoin into litecoin, for example, you have to convert bitcoin into dollars and then dollars into litecoin. Both steps incur their own set of fees. The easiest way to make a trade is to place what Einstein Exchange calls a Basic Order, more commonly referred to as a market order. 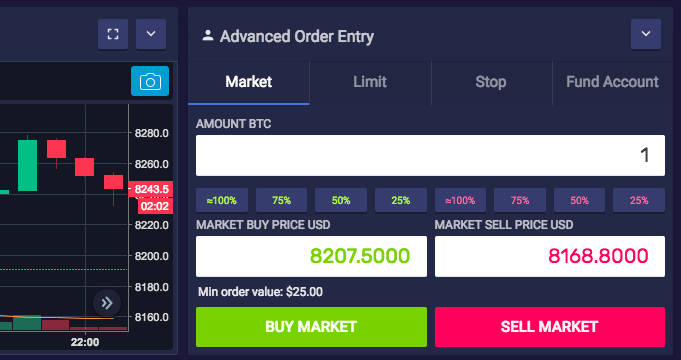 Switch out of Basic Order and into Einstein Exchange’s Advanced Order lets you place market, limit and stop orders. Institutional or individual investors wanting to make large trades can use Einstein Exchange’s over-the-counter (OTC) trading desk. 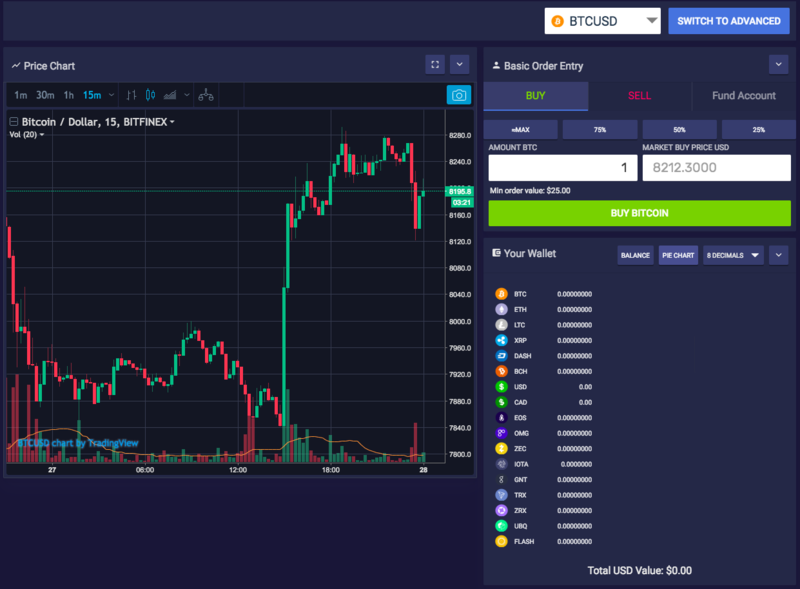 The trading platform offers many of the tools other centralized exchanges offer, including trend charts, analytical tools and an order book. When you set the interface to Basic Order, you can place market orders. Switching to Advance Order lets you place market, limit and stop orders. Einstein Exchange does not have mobile apps, but plans to launch them soon. A reply on r/einsteinexchange indicated that mobile apps would be coming in the second quarter of 2018. Due to AML/KYC regulations, Einstein Exchange does not allow fiat withdrawals or the withdrawal of any cryptocurrency purchased with fiat without verification. Deposits made through e-transfers, bank wires or EFT have no fees. The company also accepts in-person deposits at its various offices in Canada using bank drafts, certified bank notes or cashiers checks. Again, there are no fees for these deposits. Einstein Exchange accepts credit cards but only for the purchase of bitcoins. A 7.5% fee applies to each purchase. Interac Online payments also get charged a 7.5% fee. Canadians who want to withdraw fiat to their bank accounts must do so through EFT. Remember that Einstein Exchange only holds US dollars. It will charge a US $10 fee and then transfer the funds in US dollars. The bank will convert those US dollars into Canadian dollars, applying whatever exchange rate and fees the bank uses. Anyone who wants to withdraw US dollars must pay a US $50 fee and complete the transaction via bank wire. There are no fees to deposit cryptocurrency. However, Einstein Exchange does charge a flat fee for cryptocurrency withdrawals. The fee varies by cryptocurrency. A bitcoin withdrawal of any amount will cost 0.005BTC and a ripple withdrawal will cost 0.1 XRP. Due to the nature of blockchain transfers, these withdrawal fees get charged to your account. If you do not have a large enough balance to cover the fee, the withdrawal will not go through. All trades incur a 0.25% transaction fee. Flash Coin trades incur a 0.5 Flash fee. At a high level, Einstein Exchange’s features compete head-to-head with large exchanges in the regulated markets of North America and Europe. The company offers a solid listing of cryptocurrencies to trade against the US dollar. A range of funding options lets customers move fiat in and out of their accounts. And Einstein Exchange’s customer service group offers 24×7 support online, through chat and over the phone. Canadians can even walk into the Einstein Exchange’s offices for face-to-face support. But can you trust Einstein Exchange after its missteps? At a time when even long-established exchanges were struggling to keep pace with the crypto market’s growth, Einstein Exchange suffered self-inflicted wounds that made a bad impression with its early adopters. The company could have limited access to its beta program rather than throwing the doors open to the world. It’s also easy to see how the boardroom battles at Payfirma would have distracted Einstein Exchange’s leadership. Yet, over the past 7 months, Einstein Exchange strengthened its support capacity with large staff increases and the hiring of an experienced, operations-focused executive. CEO Michael Gokturk has a 2 for 2 record launching successful fintech startups and he is now free to focus on his latest endeavor. With focused effort, Einstein Exchange has a chance to repair its relationship with traders at home in Canada and around the world. All in all, Einstein Exchange has the elements of a compelling exchange, but it still has work to do to prove it can meet crypto traders’ expectations. The simple, easy to understand layout of the Einstein Exchange trading platform lets novices make simple crypto purchases. The trading fees for low-volume traders are competitive, especially for Canadians. Einstein Exchange’s rocky start may make novice traders hesitant to consider the young startup company. There’s no reason for new crypto traders not to consider Einstein Exchange as long as they understand that the company is still in “beta” mode and may still have some rough patches to smooth out. There are a lot of trading platforms competing for experienced traders’ business, but Einstein Exchange’s high-level features are worth considering. These include a solid listing of popular cryptocurrencies, support for fiat and a few advanced trading options. Where experienced traders may find Einstein Exchange lacking is the inability to make crypto-to-crypto exchanges without first converting to dollars and getting hit twice with 0.25% trading fees. High-volume traders, in particular, should consider other exchanges that offer discounted trading fees.